For both convenience and safety it is important to have secure storage for all your pool equipment. Lockers, containers, boxes, trunks are all terms used when describing storage solutions which are typically placed at the side of a swimming pool for easy access. Although most feature a similar appearance there are important choices to be made regarding size, colour and most importantly construction material. Remember that many of these stores can also double as seating or benching so having the largest size you can sensibly fit into your designated space is important as they can be utilised as handy chairs or tables for poolside snacks. The most common and inexpensive solution; the main advantages are that plastic is resilient to water and assembly is usually fast. However any non-plastic components used tend to be poor quality, this is especially relevant for the metal opening mechanism (usually gas struts) that can rust quickly. Security can also be an issue with plastic storage as hasps can be snapped off; this may not be an issue but it depends on what you store within it. Looks great next to traditional pools, especially the boxes made of teak. Downside is that most woods need yearly treatment (preservative or varnish) to ensure they look their best and do not deteriorate quickly, especially in a wet environment. If you can afford one then teak is the way to go as it gives long service life with attractive looks, but be prepared to pay in excess of £1000 (they are not cheap). However be careful if you have a modern pool as some old-fashioned wood designs can look out of place. An excellent all round solution; secure, modern and attractive. However you must use a premium quality product as cheap metal stores will rust next to a pool in a very short time. Look for those produced from coated steels, in particular PVC coated galvanised steels as these have very long service lives (20 years plus). Be prepared to pay £500 upwards for a suitable solution. If security is a priority for you then metal is the only real solution (considerably better than plastic or wood), this is important if you are storing any chemical inside which need to be kept out of reach of children or pets. Another advantage of metal is that it can be supplied in a variety of bright attractive colours, unlike plastic which is generally a dull beige or grey. 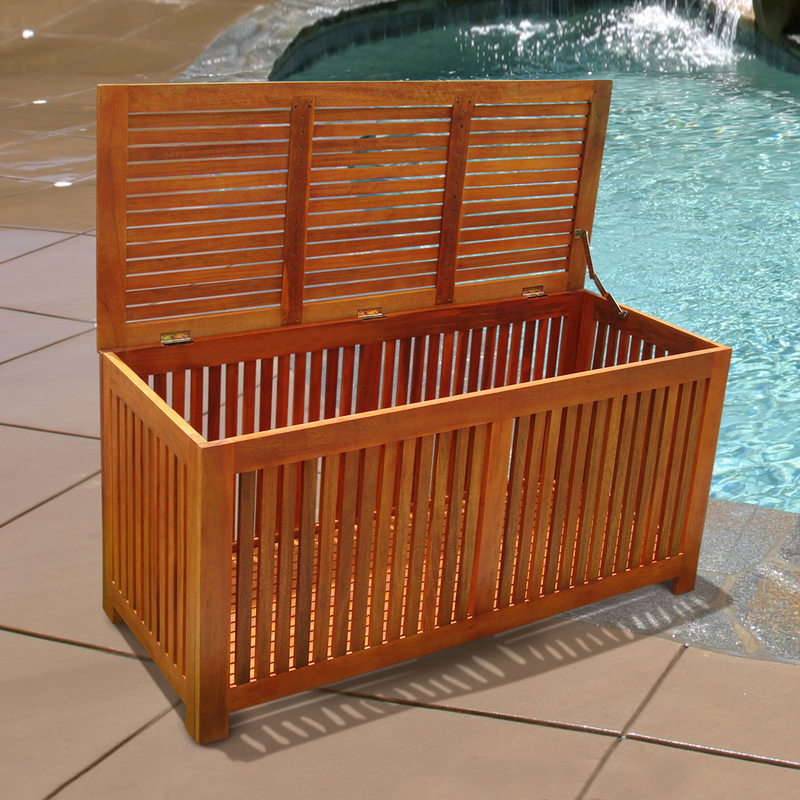 Recommendation: Whilst teak boxes are desirable they are very expensive and may not suit a modern pool environment; plastic is cheap but the service life is generally short and security is poor. If you want a secure, sturdy and long lasting solution that can become a focal point of your swimming pool area then a premium metal pool or decking box is the ideal answer.